About The Wound and Wound Toy Co. THE WOUND & WOUND TOY CO. is the original wind-up toy store with twenty years of experience. Specializing in the largest selection of wind-up toys, contemporary tins, novelties, battery operated, and music boxes from around the world, THE WOUND & WOUND TOY CO. has become a hub in the toy world for toy makers and collectors alike. Selected by Visa for its national television campaign we are happy to say we have become a Los Angeles Landmark, so come shop with us and find out why the THE WOUND & WOUND TOY CO. has satisfied so many with our unique and unusual toys. Also at THE WOUND & WOUND TOY CO., we are manufacturing our own toys with our introduction of 'Baby Bot' look for the JSTM label! 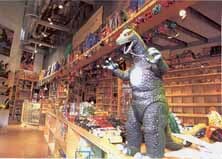 This is the inside of our second store at Universal City Walk, Outside of Hollywood's Universal Studios. In 1980, when I lived in Bayside, New York, I rescued a small wooden rocking horse from a barrel of marked down music boxes and toys. It was a musical horse that had been over-wound and no longer worked. The white paint on the horse was streaked and looked old. The saddle was painted a dull red with a small curled rope tail and his tiny stirrup and ears were made of black leather. It was perched on faded red rockers and couldn’t have been more than nine inches by six inches high. I turned it over. The price was a whopping two dollars. It could have easily passed for an antique. “Why in the world would you want a broken down horse?” my husband asked. Since I was a compulsive shopper of ‘chachkis’ (knick knacks), my husband knew he was getting off cheap. We took my new acquisition home. I sat him on the wood floor directly under our stereo. My rocking horse was right at home. I loved looking at him. On a Sunday afternoon, five years later, my husband and I were sitting on the small balcony of our apartment overlooking the bay, dotted with bobbing sailboats, and enjoying a lunch of bagels and lox when a harsh grinding sound came from the living room, jolting the quiet afternoon. “What’s wrong with the stereo?” I asked. “The stereo’s not on,” my husband said. The irritating sound continued. We followed the noise and ended up in front of the stereo. It was coming from the floor where the horse stood. After a few minutes, the grinding stopped. My husband picked up the horse and examined it. For fear of over winding it again, he slowly and carefully tried the key attached to the music box. He returned it to the floor. It started rocking, playing the haunting music of ‘Waltzing Matilda’. My stallion turned into a mare, Matilda. I sat down on the floor and surveyed this smug little hobby horse. My husband smiled and reminded me that our son, Jody was opening ‘The Wound & Wound Toy’ store at the same moment in Los Angeles. Matilda unwound herself at two o’clock in New York, it was eleven o’clock Los Angeles time. Serendipity, coincidence? I looked at my dear rocking horse. Never at a loss for words, I was speechless. Our grinning little mascot sat on the top shelf of the store looking down on the laughing grown-ups who remembered their childhood toys with nostalgia. Giggling like children, the adults were a joy to watch as they played with the toys. Now, sadly, after twenty years of fun, friendship and good will, The Wound & Wound Toy Co., a Melrose Avenue landmark, is bidding a bittersweet good-bye to neighbors and customers. Her work completed, Matilda comes home. I sit in the living room looking at my rocking horse. “When I plucked you out of that barrel in New York, I had no way of knowing that we would open a toy business, that we’d relocate to California, and for the next twenty years you’d stand watch over us; that you and I would retire to our tree house in the Hollywood Hills.